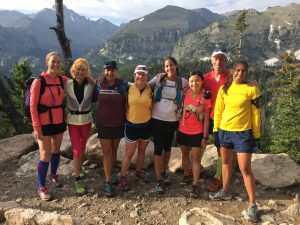 Our positive running story this time is on Emily Carr, a runner from Washington, D.C. Emily attended our advanced women’s running camp in July this year, coming with needing some help figuring out what to do with the next phase of her training. Emily not only worked that out, she took away a lot more as well, and also gave us some great ideas for cooking that we are still using to this day, as well as some cool dance moves! (Emily is in the middle of the pic above, in the orange jacket.) We followed up with an interview with Emily post camp very recently, and here is the result. Can you share a brief recap on your running history so far? I started running for the first time in the summer of 2002. I don’t remember what motivated me then, but my first race was a 9/11 Memorial 10K on 9/11/2002. I ran it with my friend Robert, who I still run with occasionally to this day. From 2002, I was on and off with my running, running one half-marathon in 2006, but pretty much sticking to 5ks and 10ks until 2010. At that time, I was running a couple of miles a couple of times a week with my boyfriend, and he actually suggested that I try the Marine Corps Marathon. My friend Robert had run it several times and agreed to run it with me. Ever since that race I have been a much more serious runner. I’ve completed 3 marathons and at least 15 half marathons, as well as a 20-mile trail race in Moab, UT. Emily runs with shelter dogs – this is Grover! You work with a running coach. Who do use, how long have they been your coach, and what difference has it made to your running? 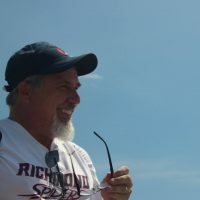 I work with Rob Falk, who is part of a coaching training group run by Debi Bernardes. Most of the people who are coached in this group are in the DC area, and most of them are much more serious athletes than me! 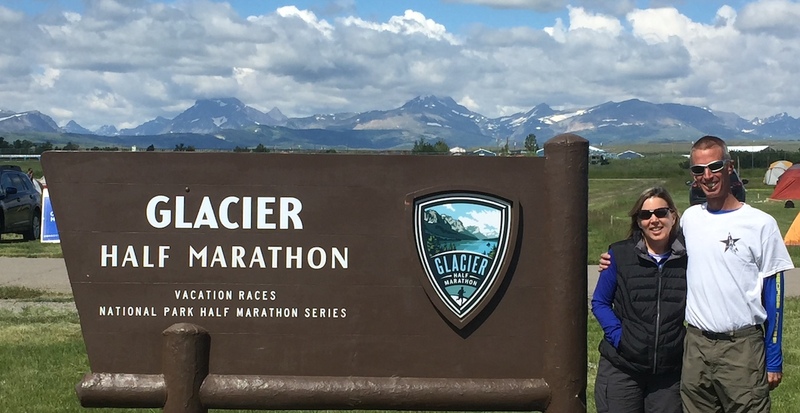 🙂 I started working with Rob about a year ago, when I signed up for the Moab Red Hot 33K, and I realize that I didn’t really know how to train for this kind of race. Rob helped me prepare and finish the race successfully and with a smile on my face! Working with Rob has given me a consistency and a focus to my running that I didn’t really have before – he has also helped me to realize the importance of being a more well-rounded athlete (strength training and yoga are key! ), and he provides good motivation and support when the going gets tough for me. Working with (and paying for) a coach helps me feel focused as an athlete. 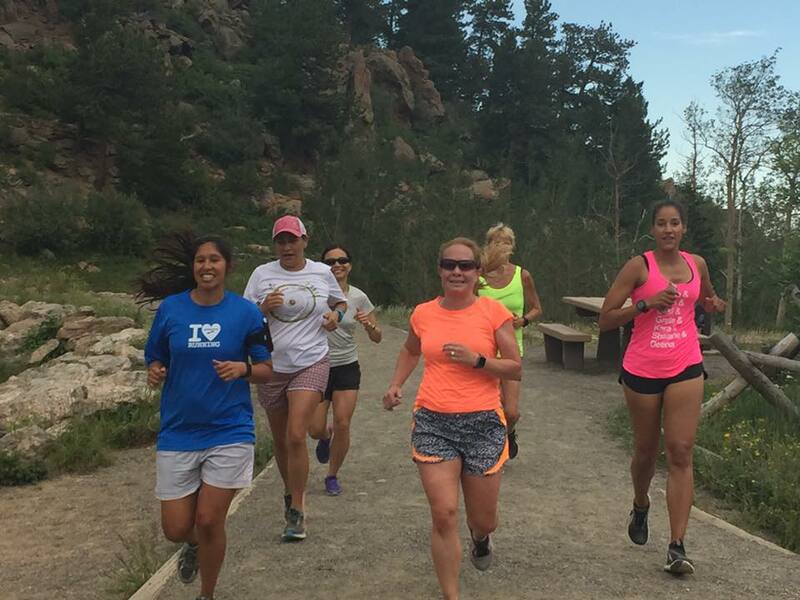 You came to our advanced women’s running camp in July this year. What did you hope to learn from camp, and what did you actually take away? My intention with coming to camp was to really figure out what I was doing with the next phase of my running. I started going through a very difficult, very sudden divorce in the fall of 2016, and I turned to running to help me get through my grief, and to have races to look forward to during a period when I had very few other bright spots. Once I finished my milestone races in the spring of 2017, I wanted to take my running to a different place that was more for my own enjoyment and not just a pure coping mechanism. “Resetting” at camp seemed like a great way to do this, and it was exactly what I needed. My biggest lesson learned at camp was that I need to always run for my own enjoyment, and focus on finding my bliss, and that has probably been the biggest change for me since camp. I now see myself as an athlete, even when I’m not at my top peak of performance, and this has really helped me to enjoy my running much more, and to also take a more holistic view of my health. Since I left camp, I have also continued with the vegetarianism that I started there and have continued on a better overall path to wellness, which also includes a better body image and letting go of the habit of dieting and struggles with food that I have had for almost 20 years. As part of this journey, I have learned so much about esteem and self-care through this process and feel like a much more centered, grounded, and healthier person inside and out. You had a challenging moment at camp when you were pulled to feel very negative about yourself. Do you mind if you share how you turned that around, and what lessons hitting that low taught you? During one of our sessions at camp, we watched the videos of our own strides, and I was really disappointed with what I saw. As positive as camp was for me, it was also challenging for me because I was the least experienced “advanced” runner there. I had not been running the kind of distance that others were for as long as they have, and I definitely felt like more of a novice. So watching a video where my form was not as good as I thought it was really hurt, and I was very upset. However, as part of our coaching sessions that day, we also talked a lot about the power of turning around negative thought, and this felt like a great opportunity. 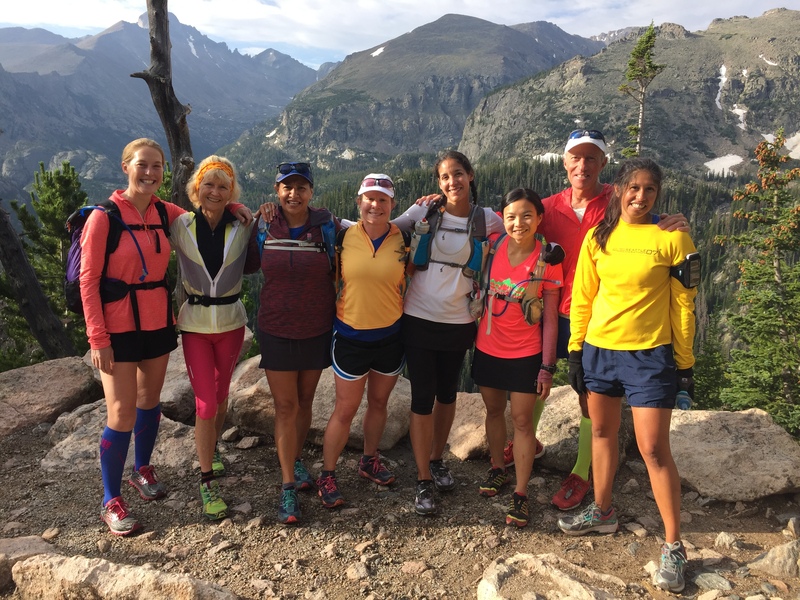 I gave a testimonial in front of the group about my experience, as well as my feelings about being a more novice runner, and was able to turn it around and talk about what I learned and the opportunity to take the experience to a positive place. The group was so incredibly supportive, especially congratulating me for my courage, and it made me realize the importance of being vulnerable. As a person who is sometimes a little slow to open up to people, I have really taken this lesson of vulnerability to heart in my everyday life and am trying to incorporate more of it into my everyday living and experiences with people in all aspects of my life. Since camp you have met up with several of your fellow campers. How important is the social aspect to your running, and why do you think women find this easier than men? 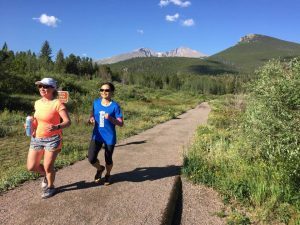 The social aspect is an incredibly important part of my running – I don’t think I would have stuck with it as long if it wasn’t for the social aspect of it. I get together for a long run with one of my best friends at least every other Sunday, and we have built a special relationship and support system through this partnership. 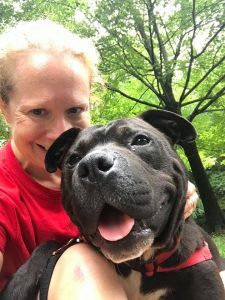 I also volunteer with a local animal rescue group, running with shelter dogs, and this is a great way to be social with both people and animals! I think that women find the social aspect of running easier for a couple of reasons. In our culture, we are not raised to be as competitive, and while not all aspects of this are positive, I do think that women tend to be better cheerleaders for each other as runners because of this. Also, women running competitively is still a relatively recent phenomenon, and every time I see a woman be successful it feels like one of the tribe has won! I don’t run with a lot of men, but I also think that the women I run with are also drawn to it because of the strength it gives them, and that’s always stronger when the group comes together. Can you share something that is uniquely Emily that no one would know by looking at you? A lot of people would probably not guess (or maybe may not even understand!) that I am an ambivert. I love connecting with people, and have a lot of strong friendships – once I open up to people I can form deep bonds quickly. However, I also still need my alone time in order to keep myself centered, and that may not always be apparent to people who see me as someone with a crowded work and social calendar. Other interesting tidbits: I love to cook, I was a music major in college, and I have recently taken up indoor rock climbing! Have the lessons you learned from running and camp had any impact on your professional life, and if so, how? I think that Camp really helped me to see myself as an athlete, a label which I would never have thought I had earned before. I have taken this self perception and have already been able to apply it, knowing now that I don’t need to wait for other people’s approval or labels for my own positive affirmations. I have also really learned true resilience through my running practice. When I finished my first marathon, someone said to me “you just ran a marathon, now you know you can do anything”. I really try to hold true to this and don’t accept the word “can’t”, whether it is my own perception or someone else’s. When I am having a tough time in another area of my life, I remember the lesson of pain being temporary that I have learned on many runs! I have also learned about self care, and that it is necessary to rest and recover to keep going in the long run. This applies to running but it is such a large metaphor for life! I especially get this when I recently decided to downshift from a full to a half marathon in my most recent race. This fall was just not going well for training, and now I feel like I will have the strength over the long run as the result of this decision. What are your goals for running and life for the rest of this year, and 2018? My goal since I left camp has really been to focus on running for enjoyment, and I want to continue to do so. I am applying for Executive MBA programs to start in the fall of 2018, and my time is more challenged now than ever, so I want to focus on running mostly for fun and not for mileage or timing goals. That being said, I would like to complete one more marathon before I start business school, and I would also like to complete a sprint triathlon before summer 2018. Plus the campers and I are planning a relay race for this summer as well, so I’ve already got a full docket! I also want to continue my wellness journey and focus on my overall health through positive body image, nutrition, and self-care. I have made such great strides in this area in the past year, and I feel great as a result so I want to continue. We wish Emily every success with her life and running, and that she follows her bliss and continues to find joy in her running, and beyond!